by assessing and responding to emerging and changing needs as defined by the membership. 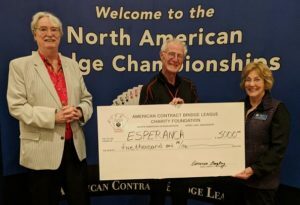 The American Contract Bridge League Charity Foundation Corporation, hereafter referred to as the ACBL Charity Foundation, was incorporated in 1964 in the State of New York. The headquarters of the corporation are at 6575 Windchase Blvd., Horn Lake MS 38637-1523. Support the ACBL Charity Foundation when you shop on Amazon. Just click here to get started. Trustees are elected to four year terms, and may not serve more than two consecutive terms. Trustees are elected by the ACBL Board of Directors. ACBL members wishing to stand for election as a Charity Foundation trustee should contact Kelley Trejo at ACBL headquarters for information. Kelley’s e-mail address is kelley.trejo@acbl.org. The ACBL Charity Foundation Board of Trustees meets at least twice a year, at the Spring and Fall NABCs. Click on the following to view minutes of board meetings held during the past four years. Money to fund the donations made by the ACBL Charity Foundation is raised primarily from the charity games held in clubs and units. In addition, there are two ACBL-wide charity games held annually in clubs, one in March and the other in November. Occasionally, individual contributions are made. Much information about the ACBL Charity Foundation can be found in its bylaws. Click ACBL Charity Foundation Bylaws to view the Bylaws. Since 1964, the ACBL Charity Foundation has made substantial contributions to a wide range of charitable organizations. To make a donation or find out more, call 662-253-3129, or e-mail kelley.trejo@acbl.org. In an effort to respond to the needs of charity in our local areas, in 2005 the ACBL Charity Foundation began issuing grants to districts rather than granting one $100,000 contribution to a national Charity of the Year. The ACBL Charity Foundation is a 501(c)3 organization, and contributions are fully tax deductible. The districts are included in a four-year cycle with the exceptions of Districts 1 and 2, where charity funds are collected by the Canadian Bridge Federation (see below). Districts 18 and 19 share one grant because their membership is split between Canada and the U.S. During the previous cycle, District 19 received a 60% share and District 18 received a 40% share. Each district will be allowed to allocate $30,000. This sum can be divided into no more than five separate grants, each of which must be made to a qualified 501(c)3 organization. The check will be written after the appropriate documentation of the 501(c)3 status has been provided, and the checks will be distributed directly to the recipients. Requests for checks will be made by the district director. The relevant district boards or their designee shall allocate the district grants. Requests for grant allocations must be made by November 15 of each year or the unused portion will be forfeited and the funds returned to the general fund of the ACBL Charity Foundation. Distribution of funds may be delayed due to availability of liquid assets, and the districts shall be promptly notified of any such delays. The Canadian Bridge Federation (CBF) Charitable Fund decides grant recipients from charity money raised in Canada. Districts 1 and 2 are both Canadian districts, and parts of districts 18 and 19 are in Canada. Each Charity Foundation trustee is entitled to distribute up to $3000 per year to charities of his/her choice. Each member of the ACBL Board of Directors who is not also a Charity Foundation trustee is allotted $1000/year to give to charities of his/her choice. The ACBL Charity Foundation also sets aside $5000 to be contributed to a qualified charity at each NABC. The local tournament committee decides the recipient. © 2019 by American Contract Bridge League.